Tired of endless hordes of heroes constantly disturbing their home-lands by digging for gold and treasure on command from their Gods, the Vengeful Mole, a fiercely territorial and disgruntled creature, decided to take matters into its own claws and teach heroes a lesson before they have a chance to smash its home yet again. 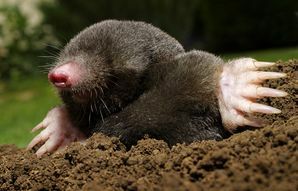 Unfortunately heroes are dumb and don't tend to learn lessons well so the Vengeful Mole is now locked in a near constant pattern of laying traps for heroes and eviscerating them in a blind rage with its razor sharp digging claws as and when they blunder into them. As a pet, the Vengeful Mole is very helpful in dungeons because it lets heroes and the team know of nearby points of interest (similar to the dungeon of clarity). It is a great pet to have. Small, agile, and difficult to hit. Vicious sharp claws honed by digging through stone and rock can cause damage to heroes. Extremely violent tendencies driven by rage can boost its attack. Can polish your armour - "It turns out that a vengeful mole sure can come in handy! Who knew that his fur could polish my armor?" Almost blind from leading a life in the dark. It is reliant on its sense of hearing and smell to aim its attacks. That said, the average hero's personal hygiene is poor so they give off a strong and distinctive smell to the Mole. Its small size means it can't take many damaging blows.